Barcelona is the fourth most visited city in Europe, so it is not surprising that the list of non-tourist places in the Catalan capital is slowing being reduced. However, it is still possible to find places full of charm, where you can take some magnificent photos of your trip to Catalonia. Yes, you have read well: although it may seem impossible, Barcelona still keeps secrets waiting to be discovered, and that are very, very close to our beachfront apartments in Barcelona. Are you going to check out this plan? If you want to get to know the city in a different way, do not miss these proposals for a surprising and unusual weekend in Barcelona. If you decide to go along Via Laietana, a centenary artery that connects Plaça d’Urquinaona with the sea front, you will come across a curious façade with eye-like figures at number 49. It is an impressive historic building designed by Heribert Salas and decorated by the architect Alonso Balaguer as a homage to George Orwell’s 1984. Currently, this property accommodates a hotel, so, in addition to photographing the exterior, you can visit its interior. If you feel somewhat tired and want to rest from the madding crowd, head to the Diagonal Mar park. It is located on Avenida Diagonal and is not as famous or as visited as the internationally known Park Güell, one of Gaudí’s works of art in Barcelona. Frequently visited by the local population, this park is characterized by a striking decoration and by the many play areas that it includes. It is ideal if you are traveling to Barcelona with children! 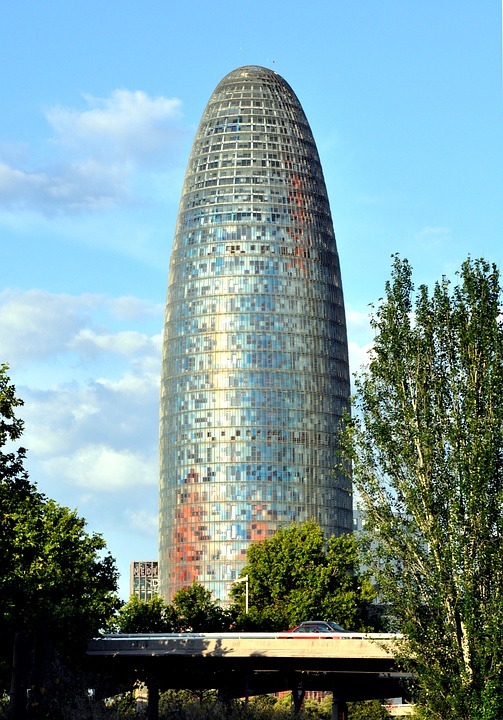 At night, head to the Agbar Tower, considered one of the most spectacular modern attractions in Barcelona. At nightfall, this skyscraper’s facade exhibits impressive lighting, reminiscent of a huge fountain or colorful geysers. This is all thanks to the undeniable talent of its author, the French architect Jean Nouvel. Do you want to discover one of the most traditional markets in Barcelona? If so, head for the Sant Antoni market, located in the neighborhood of the same name. This elegant venue opened its doors for the first time in 1882 and, after a long period of renovation, was reopened in 2018. Inside, you can taste quintessential Casa Sendra sausage, one of the most prestigious charcuterie companies in the province or take half a dozen Calaf eggs, one of the gourmet ingredients from Barcelona’s typical dishes. Do not miss the Sunday market, where you can buy secondhand and brand-new books and comic books at the best price. Hence, about 15,000 people visit it every Sunday! To see something different, go to the Encants Vells, one of the oldest flea markets in Europe, since it has been operating since the 14th century (by the way: this market is not far from the Agbar tower). Walking along its stalls, you will gather some unique and unusual memories of Barcelona. We advise you to get to the market as soon as possible, first thing in the morning, to find the best bargains. A perfect place for a romantic evening in Barcelona would be the Barceloneta neighborhood. On 7, Carrer de la Reina Cristina, you will find the excellent Can Paixano champagne bar, where you can enjoy a delicious pink sparkling wine and relax in a quiet environment, admiring the beauty of the historic streets in the surroundings. There are not many tourists in this original bar, since the clientele tends to opt for the best tapas bars in Barceloneta. You can also buy fresh seafood and Catalan wine at the neighborhood market and enjoy magnificent sea views from the terrace of your Lugaris Beach apartment in Barcelona, in the neighboring Poblenou neighborhood. There is another great place in Barcelona where you will take some fantastic photos: Las Ramblas. In the section that is closest to the port, you can see its famous living statues, one of the main icons of Barcelona. This marvel is the work of street artists who, perfectly dressed and disguised, stand motionless for hours, to resuscitate when someone passes by or throws a coin. You will see them in action from early in the morning until late at night. Finally, the surroundings of Barcelona also have essential enclaves, which include medieval villages, old cava cellars and the fabulous Pre-Pyrenees, with impressive landscapes. How about you? What other places would you add to this list of unique sites? We await your answers!